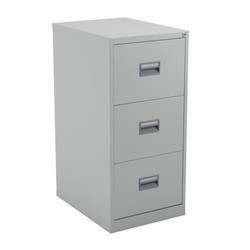 A durable 3 drawer steel filing cabinet, able to hold either A4 suspension or foolscap hanging files. 40kg loading capacity. Fully lockable. Anti-tilt mechanism. 100% drawer extension on smooth runners. 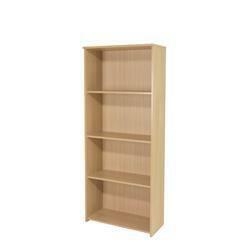 Eco 18 premium 80 bookcase. Hard wearing Oak MFC. Complete with 1 shelf. Solid back panels. Range also includes matching desks and storage. Stylish and durable storage system. Designed to fit A4 binders, lateral and suspension filing. Magnetic latching with 2 point locking system and flush handle design. Adjustable levelling feet providing 24mm of adjustment. Colour: Black. 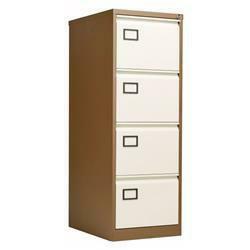 Bisley classic filing cabinet. Blue steel. 4 drawers. 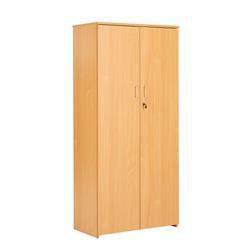 Fitted with recess handles, drawer label holders, central locking and anti-tilt safety device. Each drawer will take 45kg of suspension files. For use of suspension/hanging files only. 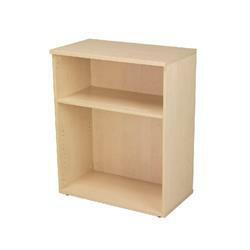 Fraction Plus 120 high bookcase. Hard wearing Nova Oak MFC. Solid wood back panels. Supplied with 3 shelves. Height adjustable shelving. Open fronted. A wide range of tables and storage are available to complement this range. 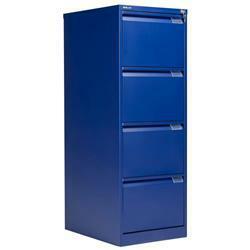 Bisley contract filing cabinet. Coffee and cream steel. 4 drawers. 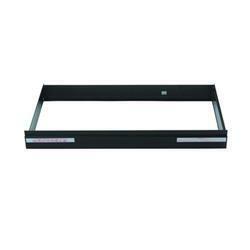 Fitted with recess handles, drawer label holders, central locking and anti-tilt safety device. Each drawer will take 35kg of suspension files. 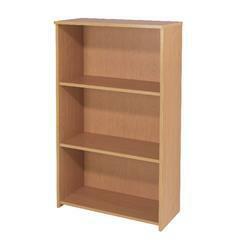 Eco 18 premium 80 bookcase. Hard wearing Beech MFC. Complete with 1 shelf. Solid back panels. Range also includes matching desks and storage. A white wooden cupboard with dark walnut doors, 2000mm high with 4 shelves supplied. Fixed shelf is 976mm high. One piece MFC back panel. FSC certified. Lockable doors with silver handles. Black adjustable feet for levelling. 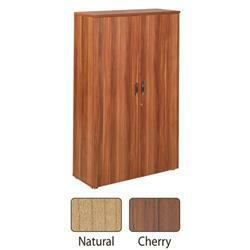 Eco 18 premium desk high 75 bookcase. Hard wearing Oak MFC. Includes 1 shelf. Solid back panels. Desk high to increase your working space. Range also includes matching desks and storage. 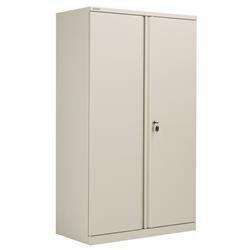 Eco 18 premium 200 cupboard. Hard wearing Beech MFC. Complete with 4 shelves. Solid back panels. Locking double doors. Range also includes matching desks and storage. A tall bookcase available in 2 finishes. Four shelves included. Fixed shelf is 785mm high. Closed hardboard back. Supplied with Black adjustable feet for levelling. Durable metal to metal fixings. The perfect accompaniment to the Start 18 desking range. 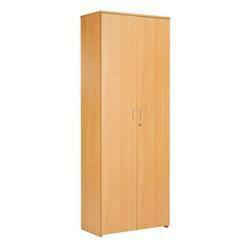 Eco 18 premium 160 cupboard. Hard wearing Beech MFC. Complete with 3 shelves. Solid back panels. Locking double doors. Range also includes matching desks and storage. Bisley essentials cupboard. Goose grey steel. Supplied empty, please choose and order your fittings. These units will take A4 binders, lateral and A4 suspension, filing A4 lever arch and A4 box file. Lockable. Convenient open faced storage unit for easy access. Complete with one shelf. Dimensions: W800xD450xH1000mm. Finish: Maple. 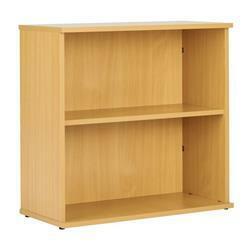 Bookcase for office use with 2 shelves. Designed to fit A4 files. Tidy organisation for your business. Supplied flat-packed for convenience. Made from sturdy 18mm thick MDF. Finish: Bavarian Beech. Dimensions: W740xD340xH1200mm. Bookcase for office use with 3 shelves. Designed to fit A4 files. Tidy organisation for your business. Supplied flat-packed for convenience. Made from sturdy 18mm thick MDF. Finish: Ferrera Oak. Dimensions: W740x340x1750mm. All roll-out fitments are supplied with an interlock for safety. All fitments are available in light grey or black. Guarantee (years): 5.